Inspiration is a fickle thing. Something that you will always chase but will rarely find when you need it most. It doesn’t hit you in that caricature lightening way, but rather seeps into your head when you least expect it. You could be falling asleep in front of the TV; stuck underneath someone’s unwashed armpit on the tube; halfway through reading page one of a book; not paying attention to someone talking to you; or – if you’re JK Rowling – waiting for a delayed train between London and Scotland. This definitely rings true for me, and I’d be interested to know if it does with other artists or creative people. A common trend I’ve found when meeting other creative people is that nearly all of us are magpies. We are collectors. Some of us are even hoarders and will probably one day end up on a Channel 4 documentary explaining exactly why we can’t live without a room full of lizard skulls or alphabetised sweet wrappers in our home. I’ve also read and heard a lot of other creative people like Moross say that they don’t look for inspiration in their own field of work. They are of course impressed and interested by it, but not necessarily ‘inspired’. Why is this? Why not seek inspiration from your peers? In one of his many, many podcasts, film director Kevin Smith frequently mentions that he completely cuts himself off from “distractions” when he is in “creator mode”, and by ‘distractions’ he means all film and related media – his own industry, in other words. Now, I’m obviously not saying that being aware of what’s going in your own creative field is always distracting, but I think that sometimes you can overload yourself with it to the point of feeling a bit redundant. 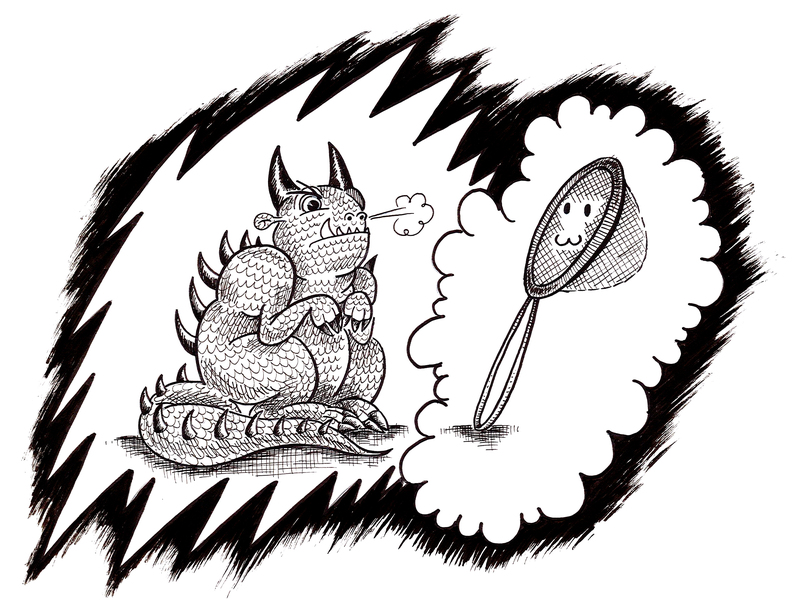 Any of those crushing little doubts ever sneak into your head like nasty little gremlins? I know they sneak into mine on an almost daily basis. These ‘Gremlins of Doubt’ are absolute killers of inspiration, and as soon as you start hearing them whispering through your head my advice would be to cut yourself off for a while. Go do something else completely unrelated. The best thing to do? Take a minute to look at your collection of stuff. That’s what always makes me feel a little better. Another problem with not looking for inspiration outside of your own creative field is that you may inadvertently start mimicking those you admire. Like most artists, I learnt to draw by copying, and I loved copying comics the most. But I became so used to copying my idols such as Frank Miller and Jim Lee that when I finally sat down to draw my own original pages, I found myself completely lost as to how to even start. It was like learning a language by repeating the words but without knowing what they meant. I had all of the skills, but no definable style of my own to funnel those skills through. How did I get around this? I went back to study the comic books I learnt from. I read The DC Guide to Pencilling Comics on my lunch breaks at work. I tentatively sketched ‘practice’ pages. And then… I ignored everything I’d researched and just drew the thing in one go. It was far from perfect, but the most important thing was: I found my own style. And weirdly, I found it by blocking out everything that inspired me so I could find myself. I used to think that to be ‘inspired’ you had to be like a sponge absorbing anything and everything around you; plastering your workspace with as much ephemera as possible. These days I think it’s actually better to be more like a sieve; to be more selective about what you hold onto and what you let go. Also, a sieve is a far more effective weapon then a sponge to whack those pesky Gremlins on the head with.